3B Umpire Mike DiMuro ejected Astros Manager AJ Hinch for arguing a Replay Review decision that affirmed DiMuro's out (fan interference) call in the top of the 6th inning of the Astros-Mariners game. With two out and one on, Astros batter Evan Gattis hit a 1-2 cutter from Mariners pitcher Taijuan Walker in the air to foul territory in left field, where shortstop Brad Miller attempted to field the fly ball, ruled an out (fan interference) by DiMuro and confirmed via Replay Review as the result of a Manager's Challenge by Hinch. Replays indicate that as the ball descended toward Miller's glove, a spectator interfered with Miller's opportunity to complete the catch, the call was irrecusable. * At the time of the ejection, the Mariners were leading, 4-2. The Mariners ultimately won the contest, 6-3. This is Mike DiMuro (16)'s first ejection of 2015. Mike DiMuro now has 1 point in the UEFL Standings (-1 Previous + 2 MLB + 0 Irrecusable = 1). Crew Chief Brian Gorman now has 16 points in Crew Division (15 Previous + 1 Irrecusable Call = 16). *Rule 3.16 [OBR 2015 Rule 6.01(e)]: "When there is spectator interference with any thrown or batted ball, the ball shall be dead at the moment of interference and the umpire shall impose such penalties as in his opinion will nullify the act of interference. APPROVED RULING: If spectator interference clearly prevents a fielder from catching a fly ball, the umpire shall declare the batter out." 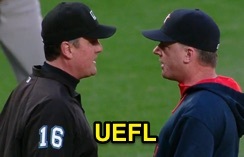 This is the 101st ejection of the 2015 MLB Regular Season. This is the 46th Manager ejection of 2015. This is the Astros' 2nd ejection of 2015, T-2nd in the AL West (SEA 4; HOU, LAA, OAK, TEX 2). This is AJ Hinch's first ejection since April 28, 2010 (Marvin Hudson; QOC = Y [Safe/Out]). This is Mike DiMuro's first ejection since June 23, 2013 (John Farrell; QOC = Y [Catch/No Catch]).